Nippon Seisen's weaving wires have superior workability resulting from treatment matching the wires' application. 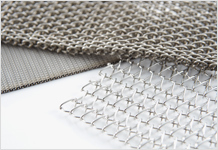 With diamond-shaped wire mesh, crimp wire mesh, welded wire mesh, woven wire mesh, knit mesh, and braids, our products are used in any number of ways and also offered with a large variety of steel types. We can suggest steel types to withstand any sort of corrosive environment – such as NAS106N, with its corrosion resistance which exceeds even that of the standard highly corrosion resistant stainless steel SUS316, or DSD1H as well as Silicolloy, dual-phase alloys which are strong against stress corrosion fractures, or even Ni base alloys like N200, which can maintain a sufficient level of corrosion resistance even in harsh environments such as seawater desalination equipment. The most well-known heat resistant stainless steel is SUS310S, however Nippon Seisen offers a large number of steel types. This includes steel types such as the low cost heat resistant steels INS307H and NAS316H1, NAS30M with heat resistance superior to that of 310S, and the Ni alloy types NCF600 and INCONEL-X750. When a wire mesh for food products fails, one good way to prevent contamination is to manufacture the wire mesh with magnetic metal and use a magnet to capture it. Nippon Seisen can suggest the ideal wire mesh materials for maintaining corrosion resistance in food product applications in addition to responding to magnets. * INCONEL is a trademark of Special Metals Corporation.